Just because a company has paid a growing dividend for decades doesn't mean it'll be doing the same for decades in the future. If you're looking for a rock solid dividend stock to invest in -- sometimes called a dividend aristocrat -- three companies that may float to the top of the list are 3M (NYSE:MMM), Honeywell (NYSE:HON), and General Mills (NYSE:GIS). They're stable companies with long histories of making money and paying dividends, which makes them appear to be very safe. But under the surface there are some disturbing trends that could negatively affect all three companies. Shareholders may want to take a second look at the risk before jumping into dividend stocks that may disappoint you long-term. 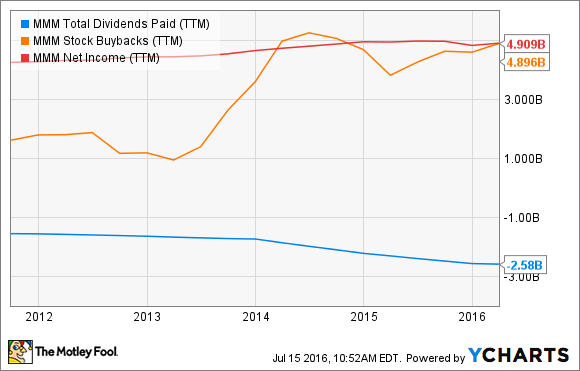 3M is often seen as one of the safest dividend payers on the market. The company is in a very diverse set of businesses, and has been paying a dividend for 99 straight years, and increased the payout for 58 consecutive years. One of the ways it's done that recently is by spending money it doesn't have. Take a look at the chart below. 3M has made $4.9 billion in net income over the past year, and returns that money to shareholders in two ways. It pays a dividend, which has cost $2.6 billion, and buys back stock, which cost $4.9 billion over the past year. But you can see that it's giving $2.6 billion of cash to shareholders that it doesn't earn from operations. The result has been an 81% jump in 3M's long-term debt over the past five years to $11.1 billion. 3M could reduce its buybacks and pay down debt if it chose to, but then it wouldn't grow earnings per share as quickly. The market tends to focus heavily on earnings per share, and if management is buying back shares it causes EPS to grow even if net income doesn't. In 3M's case, EPS are up 32% in the past five years, while net income is up just 15.3%. Companies can't continue to borrow money to pay shareholders forever, so eventually 3M is going to have to grow the core business or reduce returns to shareholders. I wouldn't say this dividend is in trouble yet, but management's focus on buybacks and dividends over managing the balance sheet is a slippery slope for a company that's supposed to be safe for investors. 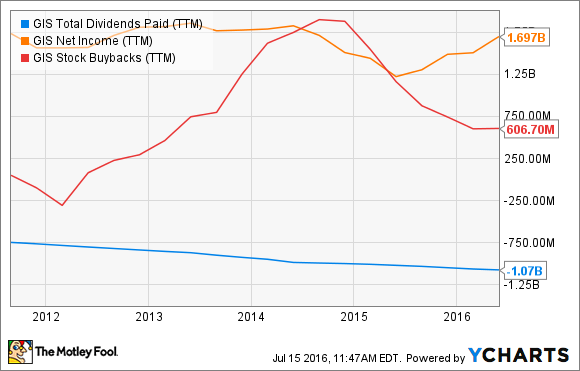 What's taking place at Honeywell is a strange dynamic of flat to declining revenue and rapidly rising profits. The company has focused on operational excellence, leading to a 76.2% jump in net income over the past five year, but revenue is up just 8.2% over the same timeframe, and is actually down since the end of 2014. To leverage bottom line growth, management has bought back $2.5 billion in stock over the past five years, plus paying $1.8 billion in dividends. That $4.3 billion returned to shareholders isn't more than the $4.8 billion in net income, but it's the long-term trends that should be concerning. Honeywell is already in a slight decline on the top line, and innovative companies are starting to upend some of its longest running businesses. Thermostats, security systems, smoke detectors, and other household items used to be dominated by Honeywell, which could use its size to sell to home improvement stores and builders. But now these are becoming consumer devices sold in retail stores, something Honeywell doesn't have the experience or brand to do compared to upstarts like Nest, Canary, and ecobee. The big concern is that Honeywell can only squeeze margin out of the bottom line for so long before it has to start growing revenue. And revenue growth is going to be difficult as small, nimble start-ups begin to take market share in products Honeywell used to dominate. 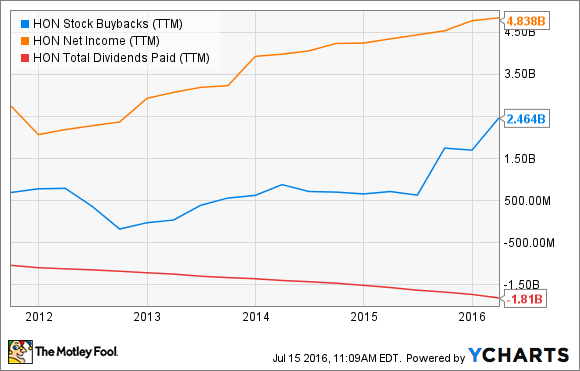 A dividend aristocrat needs a rock solid business on which to build its dividend payout, and I don't see Honeywell's business as very stable today. Food giant General Mills is in a similar position to Honeywell, except it's seeing no growth on the bottom line. The company is facing competition from upstarts in organic and natural foods, and changing consumer preferences are wreaking havoc on the business. Amidst all the challenges, management keeps increasing the dividend and buying back stock. You can see below that buybacks alone have exceeded net income in the past year. These cash expenditures are on top of acquisitions like Annie's ($820 million) and EPIC Provisions (undisclosed). General Mills is trying to buy its way into new markets, but that doesn't come cheap, and requires cash flows from operations, which the company is currently giving to shareholders. Again, when the core business isn't growing it puts a company in a tough position. Do you pay dividends, buy back shares, invest in organic growth, or buy competitors? General Mills needs cash just to keep its business afloat, and that makes the dividend less attractive than that of companies with room for dividend growth. The core problem at 3M, Honeywell, and General Mills is that management wants to increase dividends, buy back shares, and increase earnings. But that requires core businesses that are fundamentally strong. And each has their own struggles growing the core business -- which doesn't bode well for these dividends being the aristocrats we once thought they were.